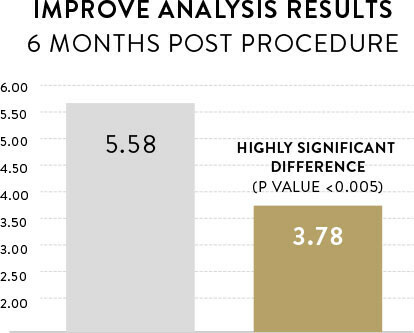 Level 1 clinical data is the gold standard for evaluating the efficacy of a device. 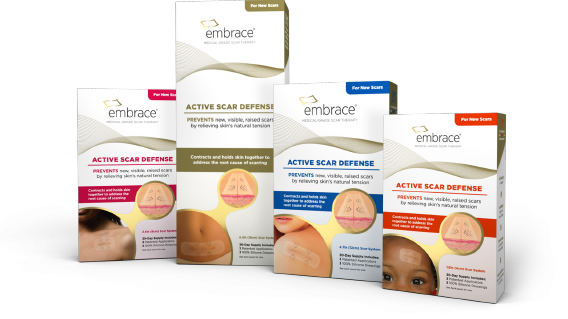 embrace® Active Scar Defense is the only scar treatment on the market proven effective in Level 1 trials. Longaker, MT et al. 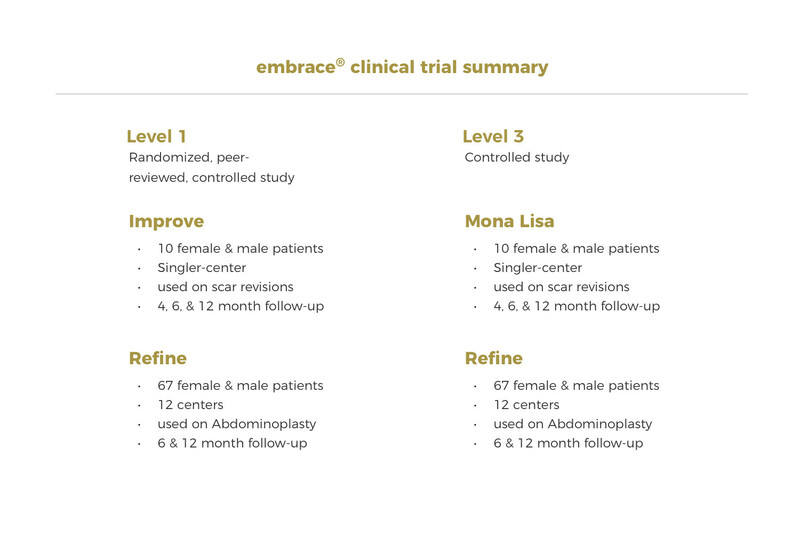 A Randomized Controlled Trial of the embrace® Device to Reduce Incisional Scar Formation. Plast Reconstr Surg. 2014 Sep;134(3):536-46. Lim AF, et al. 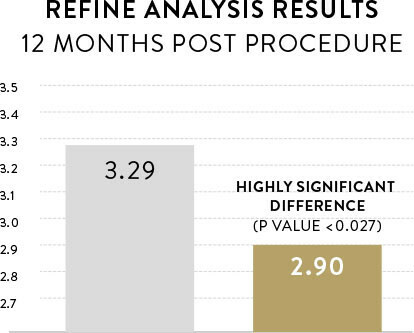 The embrace® Device Significantly Decreases Scarring Following Scar Revision Surgery in a Randomized Controlled Trial. Plast Reconstr Surg. 2014;133:398-405. Gurtner GC, et al. “Improving Cutaneous Scar by Controlling the Mechanical Environment: Large Animal and Phase 1 Studies.” Annals of Surgery 254-2 (2011): 217-225. Akaishi, S., Akimoto, M., Ogawa, R. & Hyakusoku, H. The relationship between keloid growth pattern and stretching tension: visual analysis using the finite element method. Ann Plast Surg 60 (2008). Gurtner G., Werner S., Barrandon Y., Longaker M.T., et al. Wound repair and regeneration. NATURE 453: 314-21 (May 2008). Aarabi, S., Bhatt KA, Shi Y, Paterno, J., Chang, E.I., Loh S.A., Holmes, J.W., Longaker, M.T., Yee, H., Gurtner, G.C. Mechanical load initiates hypertrophic scar formation through decreased cellular apoptosis. The FASEB Journal J 21:3250-61 (2007). Young, V.L., Hutchison, J. 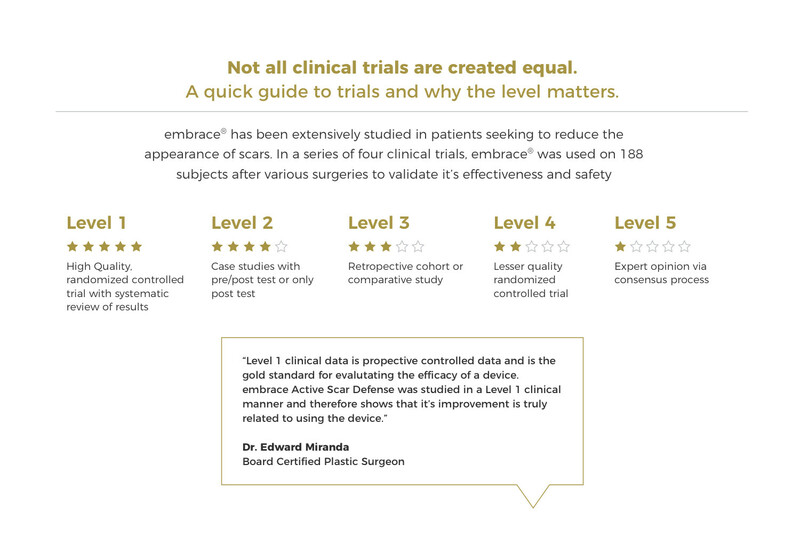 Insights into Patient and Clinician Concerns about Scar Appearance: Semiquantitative Structured Surveys. Plastic Reconstr Surg. 2009;124(1);256-265. Rankin, M. and Borah, G. Perceived Functional Impact of Abnormal Facial Appearance. Plastic Reconstr Surg. 2003;111 (7);2140-2146.